Valparaiso. They call the city “Little San Francisco” and arriving feels just like stepping off the Caltrain. The ocean comes right up against the city, there’s a thin flat section of artificial land against the water, and then the hills start. Streets slope straight up, residents can either wind their way up any of the staircases or be winched up in trams built into the hills. The actual English word for those is funiculars, but everyone calls them trams. In Spanish, ascensores. Long ago Valparaiso was Chile’s most important city, due to its port. Anyone making the sea voyage round South America up to North America had to stop in. Chile’s first public library was founded here, and the first volunteer fire department. Valparaiso used to be the place to come to seek out a new life. But then the Panama Canal came along and put the entire city out of business. Valpo fell into decline for decades, slowly becoming cheap enough to live in that artists started to gather. Street art is everywhere now. Graffiti and murals, on walls or sidewalks or the vertical sections of stairways. Now it’s starting to be a place where people want to live again. Everyone heads out to parties after dark finally falls, around maybe 9:30 or 10 this far south. Then in the morning the city is maybe the quietest city you’ve ever been in. It’s covered in fog off the sea and it’s chilly and it’s a haven for more reasons than one. Valparaiso’s story: Booming industry city falls to ruin and once it’s decayed enough makers come in and build it back up. Is this going to be Detroit’s story, too? I’ve been wearing for days. then dropped in a plastic bag. The empanada microwaved before sale. Is this wandering and drinking bad coffee some glimpse of Kerouac’s life? Argentina 1. To Chile, via Paso Pichachen. When I was growing up I was told “Go west, young man” and that ended up shaping my life, so far. It still holds true here in Argentina and Chile; a week of going south in Argentina is enough of dusty desert riding and so the bike gets pointed west back towards Chile. There’s a thin road on the maps leading up into the Andes, promising another low traffic dirt pass: Paso Pichachen. First say goodbye to Lee, traditional cyclist farewell involves two rounds of bakery-bought cake, dulce de leche permeated sweetness. Lee continues south, bound to a tighter deadline for wrapping up his tour. The end of my trip is coming, but there’s still a bit of time left. Set off solo again, probably for the last time on this journey. 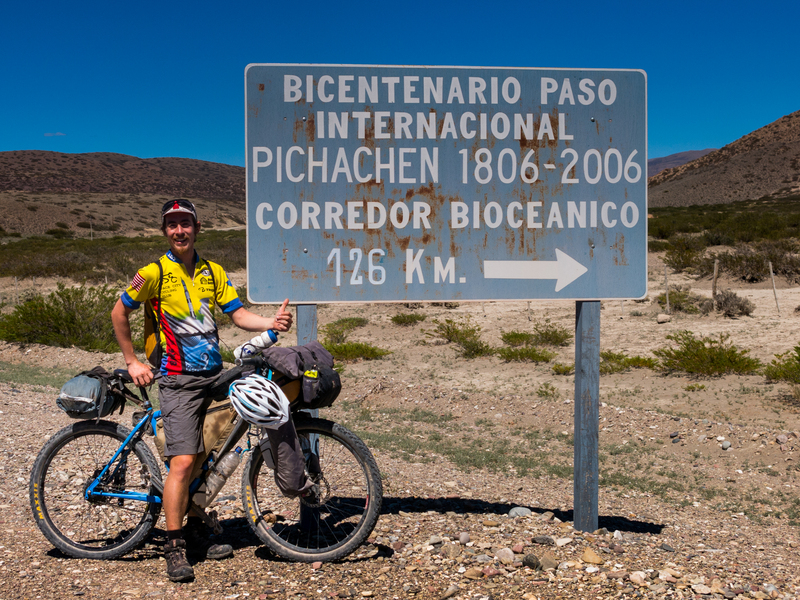 A meet-up with Paul is scheduled when he finishes riding in northern Chile and Argentina. But for now it’s just Ace and me on the road, a return to mental contemplation accompanied by legs pumping up and down, over and over. It’s far enough south that the sun comes up early and sets late, and these are the best days to let thoughts swirl however they may. Chile 1. To Argentina, via Paso Vergara. There was a brief stint of riding in northern Chile. Then there was a jump ahead to go spend the holidays with a friend from home and her family. It’s been a while on the road, and the end looms near. Being able to spend time welcomed and treated as part of a family, incredible. Thank you. We have alternative extended families in other cyclists, effectively. The cyclist network connects more or less all of us now. So many of us are looking at calendars and it’s been 1 year, 2 years, maybe more that we’ve been on the road. Slowly we meet each other, slowly word gets passed around of who else is nearby or rode through in the past few months. Slowly the network grows. By the time we get to central Chile and Argentina, we all know each other one way or another. Chile. Been here now for a few weeks, and it’s been a bit of an adjustment. To being in a wealthy country, around people and family like me. There’s this idea of beauty being found in extremes, from scorching deserts to freezing arctic tundra, and in that, Bolivia does not disappoint. Press on further and further into the desert. Vegetation disappears entirely in places, llamas and their companions roam in larger and larger circles looking for food. When the winds come, they kick up mini-sandstorms. Duck behind the mini-dunes to hide, pull up the hood of your raincoat. Wait it out. Empty your pockets later and you’ll find you’ve since been carting around a few extra grams of dirt. 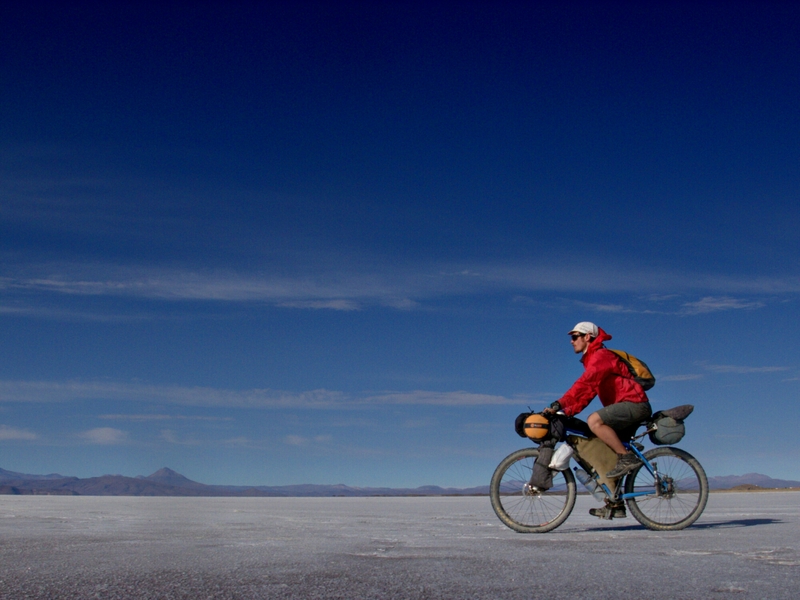 Bike and body washed clean of salt, leave Uyuni heading south. Washboard roads give way to faint tracks etched across the desert, road heads for the provincial capitol but that’s not to say it’s a highly trafficked destination. Aiming for the Eduardo Avaroa National Reserve, home to distinctly colored mineral lakes, and on the other side of that, Chile. Skirting the edge of the altiplano, from pancake flat roads re-enter the mountainous border and once again start planning daily distances by how many passes are in the way. En route to the first pass, start to take breaks huddled against roadside rock walls, the only windbreaks around. Would have been a good day to set up camp early instead of fighting the daily late-afternoon winds, but lacking water to cook press on over the pass to the next village. Sleep there at the local hospital, am offered a bed in a room where a patient is sleeping but that seems a little questionable. Instead they put a mattress out in the entrance room and I’ll pass out there. Salt flats, Bolivian cycling classic. The smaller Salar de Coipasa to the north, ride off soft sand corrugations and all of a sudden the ground becomes flat, reflecting white everywhere, hard but the topmost layer away from the “highways” crunches as wheels turn over it. This southwest corner of Bolivia, nearby in Chile too, is full of salty ground. The Altiplano region is surrounded by mountains, and what little moisture there is has no way to drain away, instead evaporating and leaving behind salt. In such an environment, moisturizer (uses: human skin, and rubber o-rings on mechanical equipment) is a great thing to carry.